Oren Rose stopped by this afternoon (11/24/02) with a few more pictures. Here's a shot of Kingfisher #2. Anybody recognize the pilot? 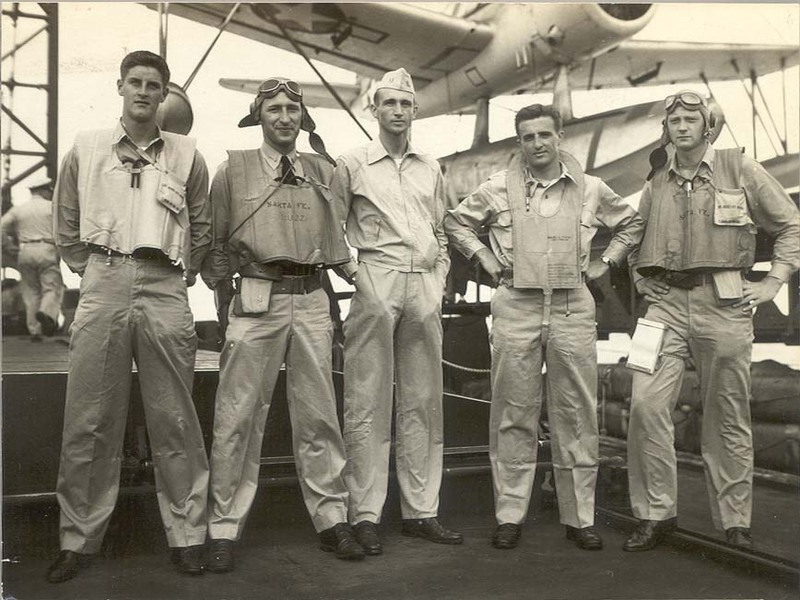 My Dad, Lt. Theodore (Ted) Buzanoski, was a pilot aboard the Santa Fe – flying the Kingfishers, and while I’ve not yet been through all the photos, I did spot Dad in “Aviators 1.” He’s the second man from the left. 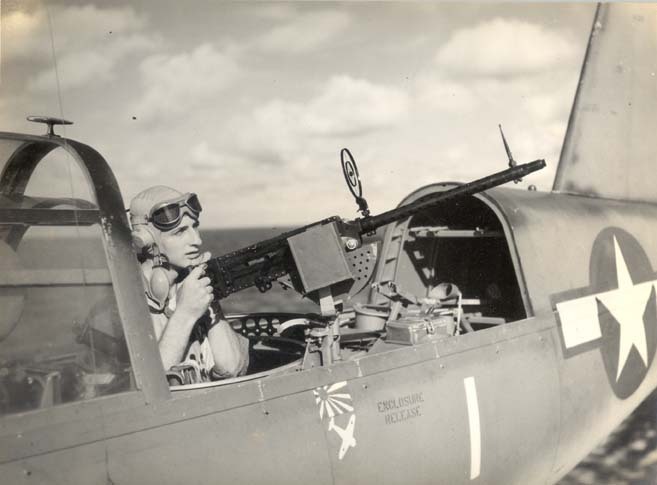 It also very much looks like him in the gunner’s seat in “Aviators 3,” but it's hard to tell. I know he didn’t fly in that seat, but this might’ve been a photo op. Unfortunately, Dad passed away back in 1990. When I received that note from Dave, I asked him whether he'd ever heard this story from Chapter 4 of Steve Jackson's book, "Lucky Lady:"
"Berkey brought the Santa Fe as close as he could to the shore to blast away at the Japanese, risking return fire from well-entrenched shore batteries, including eight-inch coastal defense guns brought from the fall of Singapore. Even one of the cruiser’s Kingfisher pilots got into the act. Lt. (jg) Theodore Buzanoski was flying low over the island relaying target locations to the ship when he spotted an ammunition dump. He took a run at the dump and released a bomb he carried, scoring a direct hit that sent the ammunition skyrocketing in massive detonations." "Thanks for the Chapter 4 text. This was one of the war stories that Dad used to tell. The little twist from my recollection of the story was that either he wasn’t sure it was an ammunition dump, or perhaps underestimated its size. In any case, I recall him saying that he was flying so low the size of the explosion almost took him out of the sky. I’m not sure if that was the same run, but on returning to the Santa Fe, in checking his parachute (which the pilots sat on) he discovered a small-arms round had pierced the plane and lodged in his parachute a few nylon layers from his backside. Sure glad they made it home. Otherwise you and I wouldn’t be exchanging E-mails. Regarding the photos “Aviators 1-2-3,” I think you’re right. I was a little surprised to see him in the gunner’s seat, but again, might have been just a photo-op. I have seen photo 1 somewhere before, but not 2 or 3." Also, from Don Jackson: Aviators #1: Aviator on left I believe is Buzanoski. I believe he was an Ensign or Lieutenant Junior Grade. 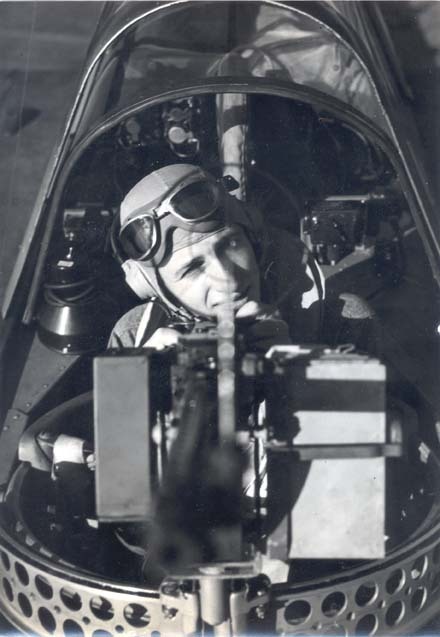 Also believe he was the Kingfisher pilot when his Radioman/Gunner shot down a Japanese fighter aircraft. And that's a discrepancy. Buzanoski's son says his Dad is SECOND from left. So who is the fellow on the left? Is he the pilot of the plane that shot down a Japanese fighter aircraft? 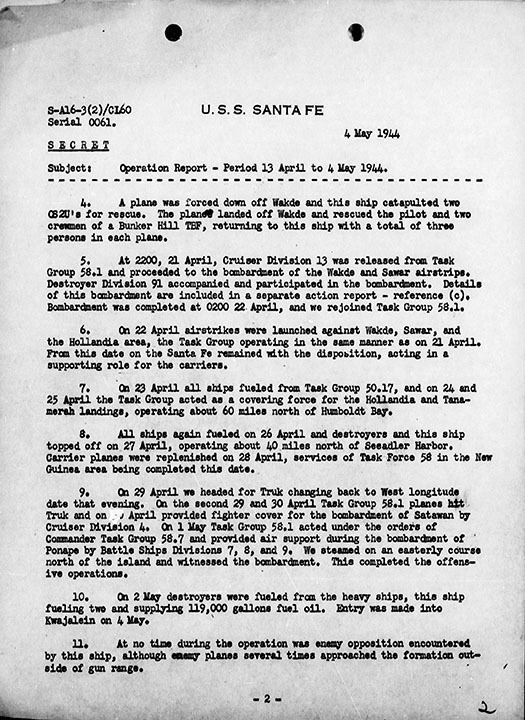 My Dad, Lt. (jg) Ted Buzanoski was not the pilot of the Kingfisher that shot down the Japanese fighter; it was Lt. (jg) Robert Henderschott whose personal account of the encounter is attached to the Action Report mentioned above. The radioman/gunner was Hickman, A.E., ARM2c USNR. 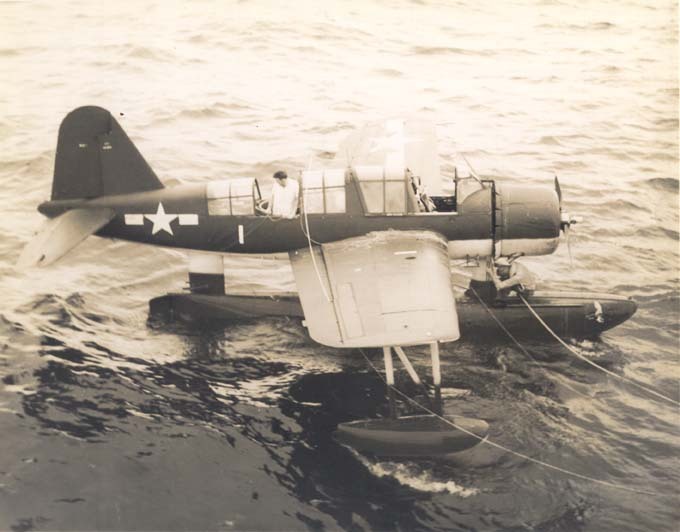 Lt. Buzanoski had been sent out earlier that day to pick up a downed aviator (Lt. William Knox Blair) from the water near Haha Jima. Lt. Henderschott's plane was attacked by three Zero's while spotting for the Iwo Jima bombardment. Hickman shot down one of them while the Kingfisher was "completely riddled by machine gun fire". 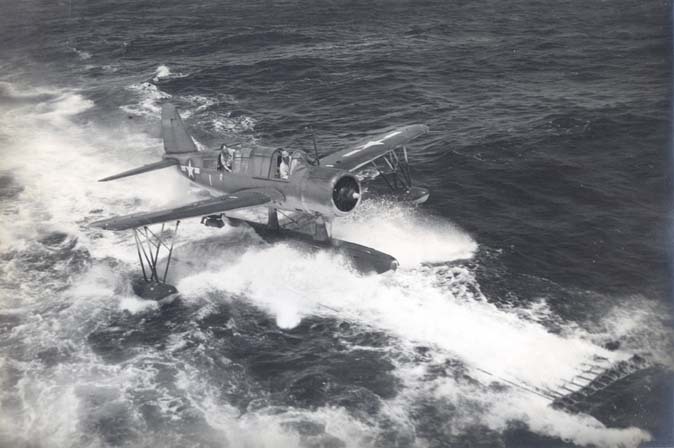 Lt. Henderschott made it back to the "destroyer screen" where the plane's engine froze, and he made a "fairly normal full stall landing" on the water within sight of the Santa Fe. 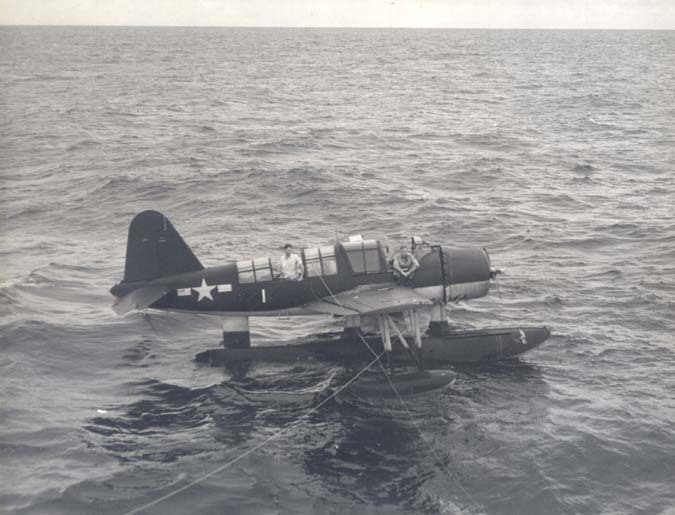 The plane flipped over within 20 seconds of landing but remained afloat until the destroyer Burns picked up Henderschott and Hickman. The Burns then rammed the plane to sink the wreckage. 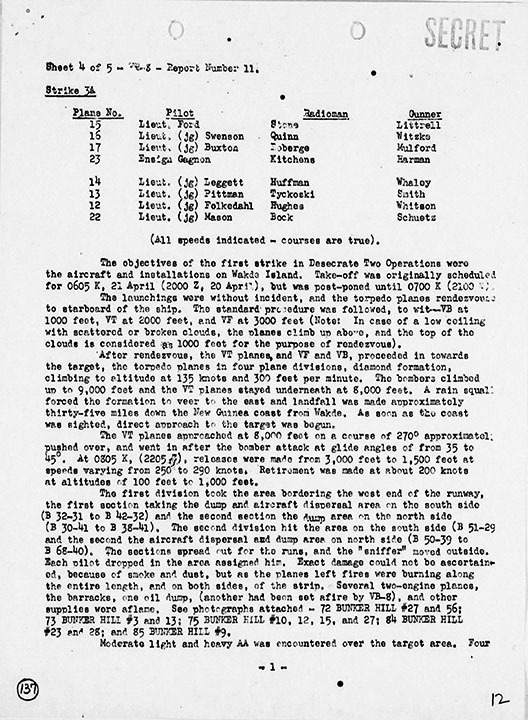 You will notice at the bottom of the first photo of the Operation Charts section ("Actions Against the Enemy") the figure of a seaplane appears with the date July 4, 1944. I believe this figure represents Lt. Henderschott's plane that was shot down that day. Still another note -- this from Jerry Buzanoski on November 22, 2002: It was good to see Al Mancini's positive identification of four of the flyers in Aviators 1. Could the uncertain ID (man second from right) be Woody Voss? (Al seems to think his name began with V.) Voss appears on my Dad's list of "companions" along with Tunnell, Zamucen, Hendershott, Jim Simpson, and Fred Mears. Reid Price and Jack Kenney appear to be added to the list at a later date since the ink is of a different color. As it might help to associate names with faces in other photos, Ted Buzanoski, Art Hickman, and Bob Henderschott appear in the photos on the bottom of pages 52 and 53 of the Santa Fe Cruise Record. Ted is standing in Kingfisher 2, and I assume Art Hickman is standing on the wing, since my Dad's personnal log states that Hickman flew that rescue mission with him. Bob Henderschott flew alone in Kingfisher 1, so he must be the man on the left shaking hands with the rescued pilot (Swenson) in the bottom right photo on page 53. Do you see a resemblance between Hickman (the man on the wing in the photo on page 52) and the unidentified man in Aviators 1? For the record, the rescued aviator sitting in the rear cockpit of #2 is Radio-Gunner K.E. Quinn of Monessen, PA. (This information from a Connecticut newpaper clipping.) The third rescued aviator was a man named Witzke. He may be the man in the background of the picture of Henderschott and Swenson. I hope this helps someone to find the last piece of the puzzle. I told Dave that if his Dad was second from left in Aviators 1, then this has to be a picture of his Dad too. My father is the Arthur Edward Hickman in some of your pics on the net. There is one unknown one taken from above that I cannot tell if its him or not (labeled "New Aviators Picture"). The ones labeled "Aviators 2" and "Aviators 3" are my father. I've sent the link to my sisters to see what they have to say. 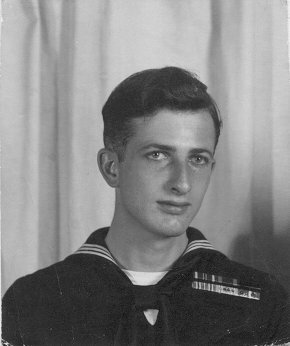 I have one picture of him (just out of the Navy then) when he was young that I could scan to send to you. I also have a Xerox of an ad from a magazine that my dad had gotten from Hendershott that details the aerial fight. The last I knew, Henderschott lived in/near the Seattle area. My dad lives in Pueblo, CO presently. "I remember my Dad being an avid reader and it wasn't until years later that he actually read what it was that he had blown up. He said from the air it looked like a giant, perfectly round hole so he decided to see how good he was and dropped the bomb down the hole. He remembered the plane being pushed up from the blast." Jerry Buzanoski and I have been having a few email conversations since you forwarded the picture I had sent to you. He also has some additional pictures. One of his pictures is of a Kingfisher with pilot and radio operator. I noticed a Zero painted on the side, and Aviators 3 has a Zero painted on the side of the Kingfisher. Seems that the Zero would only be on the side of the Kingfisher of Henderschott and Hickman's plane. (Obviously the replacement airplane.) Jerry said he is going to send Henderschott the pictures and see what he has to say. That probably tosses more confusion about the pictures. 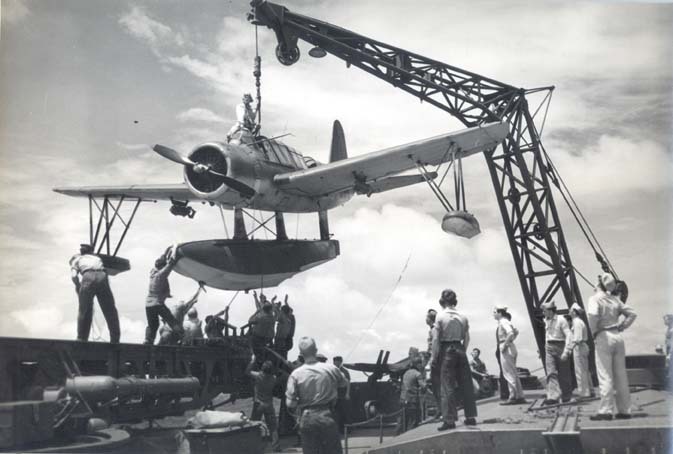 I believe photos Aviators 4, and 9 through 12 are consecutive photos on a roll of film, the subject being the return of the second of the two rescue flights to the Camotes Islands in mid-September 1944. These flights were mentioned on page 67 of the USS Santa Fe Cruise Record. A picture of the first flight to return (Kingfisher 2, as marked on the wing) also appears on page 67. I’m sure Aviators 5 was snapped just previous to the photo at the middle of page 67. 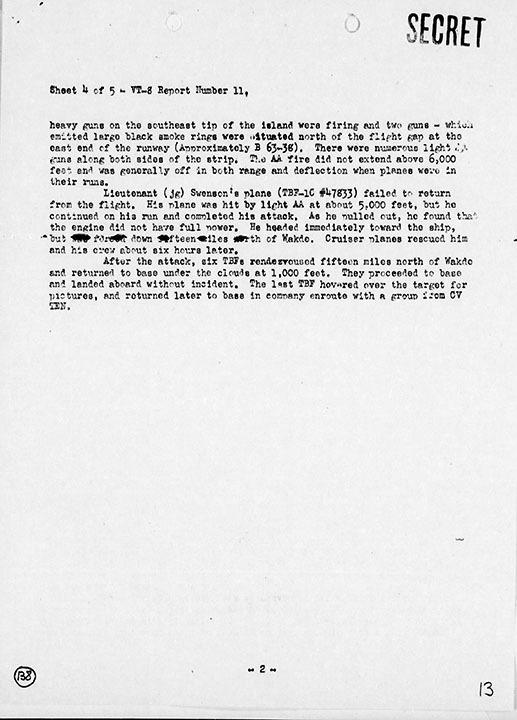 The Cruise Record notes that the rescued pilots were dressed in Filipino” civvies”. Photos 4, 9 and 10 are of Kingfisher 1 and show another man in what appears to be Filipino attire. The series of photos appears to show a somewhat unconventional recovery. Lines from ship to plane are clearly visible. 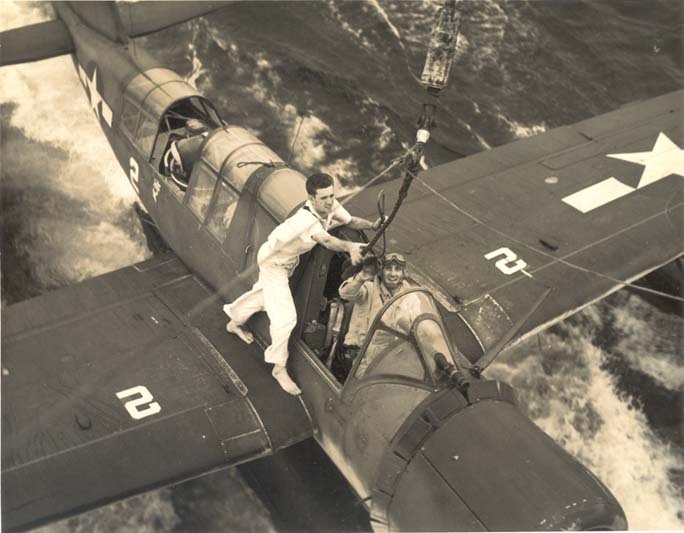 In Aviators 4, the pilot appears to be attaching one of the lines to the plane. I believe my Dad, Lt. (jg) Ted Buzanoski is the pilot in this series of photos. At the date of these rescues he was Senior Aviator of the Santa Fe, having relieved Lt. Henderschott of this duty in mid-August. Also, the haircut and color look very much like another picture of my Dad standing in Kingfisher 2 on page 52 of the Cruise Record. My Dad told me a story of having picked up a downed pilot who had pleaded with him to make a swing over an area of ocean where a buddy in another plane had been shot down. My Dad initially declined, citing a low level of fuel in the aircraft. He finally agreed to take a quick look (which was unsuccessful) but ran out of fuel on the return to the Santa Fe. The photos referenced above may show the recovery of the pilots from a plane with no fuel. 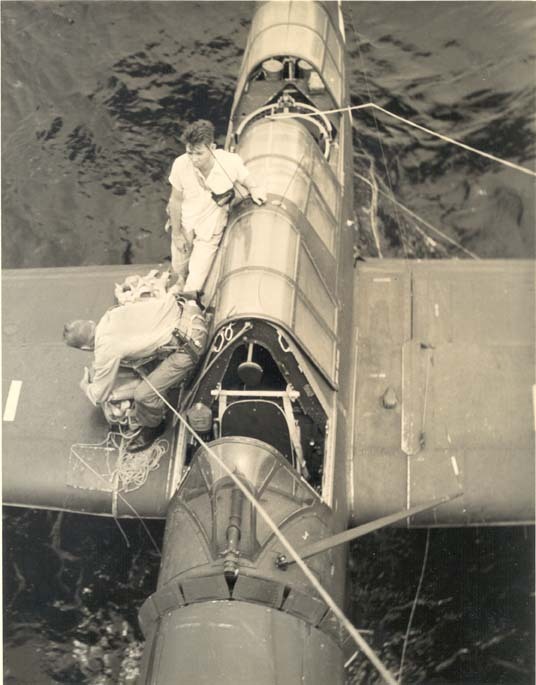 A different method of recovery of Kingfisher 2 is under way in the photo on page 67 of the Cruise Record. You will notice that Aviators 10 shows the pilot bending over what appears to be gear on the wing of the plane. It looks like he is packing gear into a bag for hauling onto the ship. 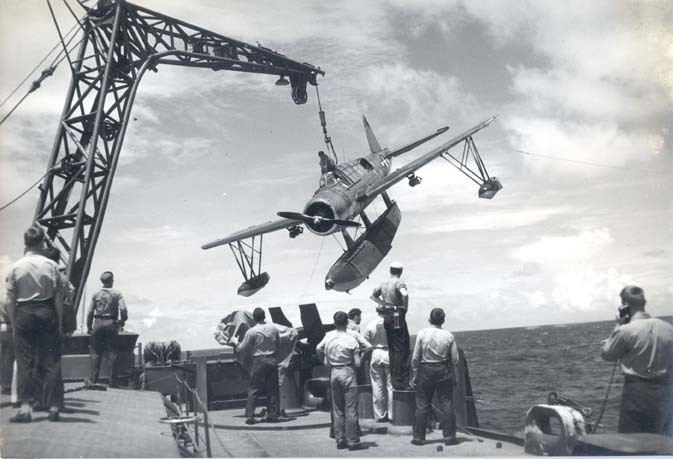 This would seem unusual for a plane that was to be hoisted momentarily back onto the ship. 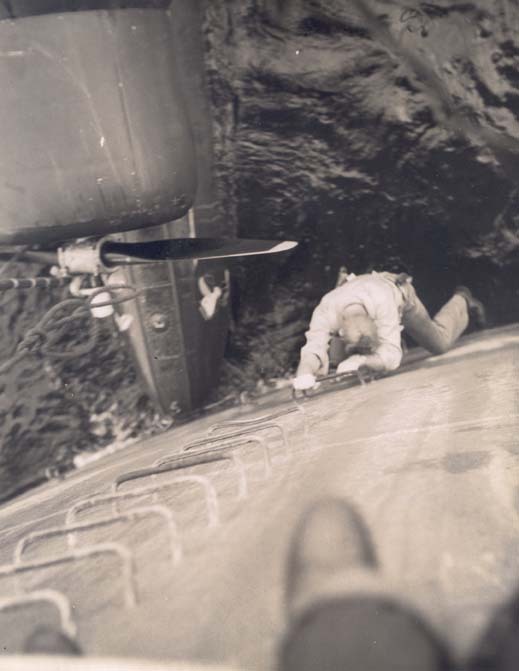 Aviators 11 and 12 show the pilot and passenger climbing the ladder up onto the ship. The plane seems to be drifting away from the ship in Aviators 12 as a line falls slack. The only sad part to the story my Dad told me was that, because of the dangerous location, the ship could not linger long enough to recover the plane with its crane. The plane was sunk with the ships guns. I hope that your Dad or someone visiting your website can confirm the connection of the story to these photos. Al Mancini says: Picture #5--Kline, but I haven't a clue which man he's talking about. I finally made my long-anticipated trip to the National Archives to review the Santa Fe Deck Logs. Thank you for alerting me to their whereabouts. It was a worthwhile trip. Combining information from the Santa Fe "Cruise Record" and the Deck Logs I am confident that I have identified the individuals in a few more of the "Aviators" photos. 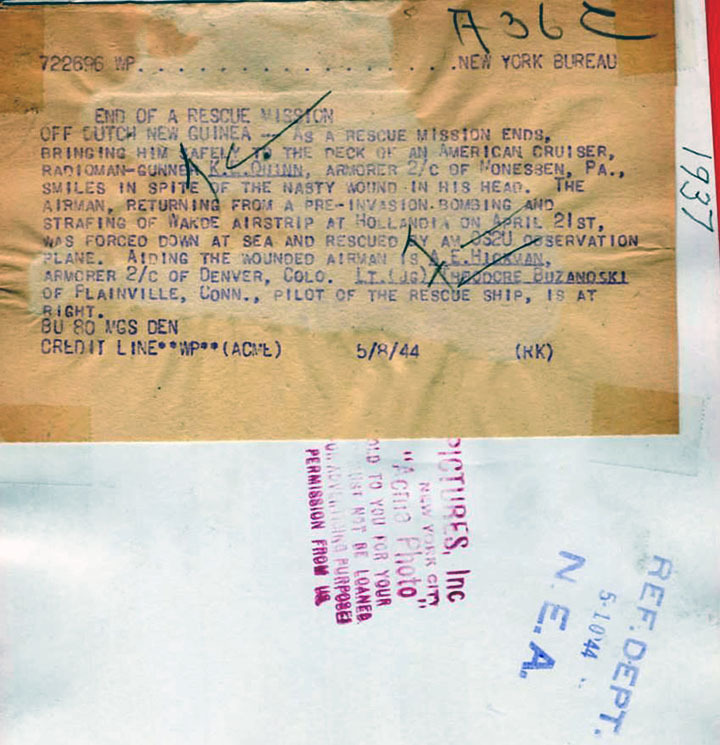 The “New Aviators Picture” and one similar to Aviators #5 both appear in the Cruise Record with narrative about a rescue of two downed pilots near the Camotes Islands in mid-September 1944. The Deck Log indicates that T.T. Buzanoski and R.M. Buddington flew that rescue mission (in separate planes) on 9/14/44. The pilot of Kingfisher #2 in “New Aviators Picture” is not Buzanoski (my dad), so it must be Buddington. 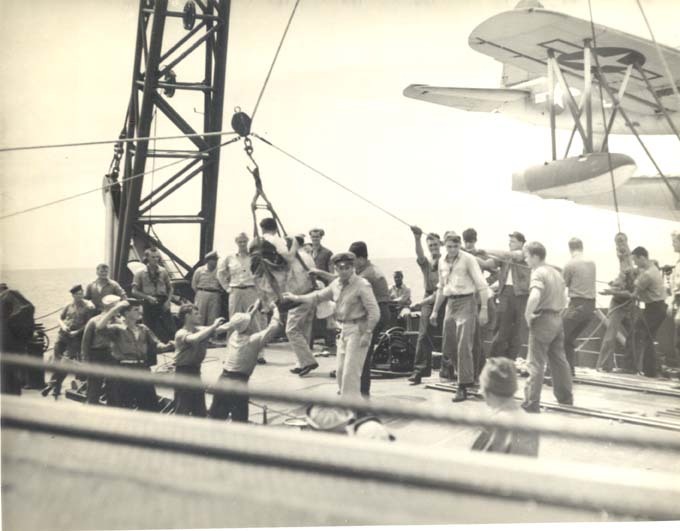 The Cruise record explains that the two rescued airmen wore Filipino civvies as they were hidden from the Japanese by Filipinos. Because the "passenger" in Aviators Nos. 4 and 9 is wearing attire similar to that worn by the rescued airman in “New Aviators Picture”, it's likely that the subject of these photos is also the Camotes Islands rescue. If that is the case, the pilot of Kingfisher #1 in Aviators Nos. 4, 9, 10, and 11 is Buzanoski as I had suggested in my letter to you last fall. The Deck Log for that date also confirms that the ship was unable to retrieve Kingfisher #1 as it was "dead in the water" and the ship's crane had failed. After ordering the men off of the plane the Captain ordered the destroyer Cassin Young to sink it. The Deck Log indicates that, within an hour of recovering the Pilot of Kingfisher #1 and the rescued airman, passengers J. Henry AOM2/c USNR and R.G. Hassong USNR were transferred to the destroyer Callaghan. This transfer is likely the subject of Aviators #5. 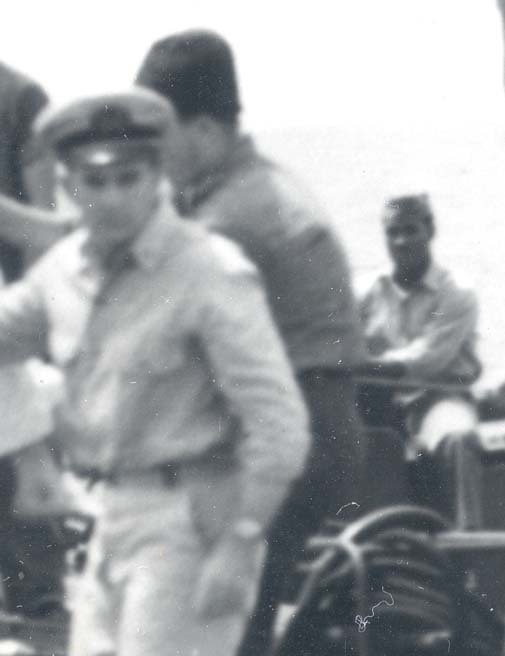 This from Don Jackson: In the picture where Andy sits in background, I believe Chief Boatswain Allord is in the foreground. He was a Chief Warrant Officer. Al Mancini says: Picture #6--"Tiny" Schmitt (Concord, Ca.) But who is he talking about? The guy sitting on the airplane's cockpit? Picture #9-10-11-12--Rescued pilot (another Ship)??? LT.Blair ?? Hi Jerry. Looks like I finally figured out your email address. The hotmail acct I used for you back in 2002(?) no longer works. I thought you'd like to see this message I recently received. I'm trying to put the pictures on my website http://usssantafe.net but I'm not sure where it all belongs. I have info on an incident from July 4 that year, but this is May 4. A different incident? Do you know anything about it? Thanks. Great to hear from you. Sorry for the trouble locating my current email address. My dad noted the Wakde rescues as occurring on April 21-22, 1944.. He flew scout plane #2 with Art Hickman and picked up radioman, Quinn. Bob Hendershott flew scout plane #1 alone and picked up pilot, Swenson, and gunner, Witzke. 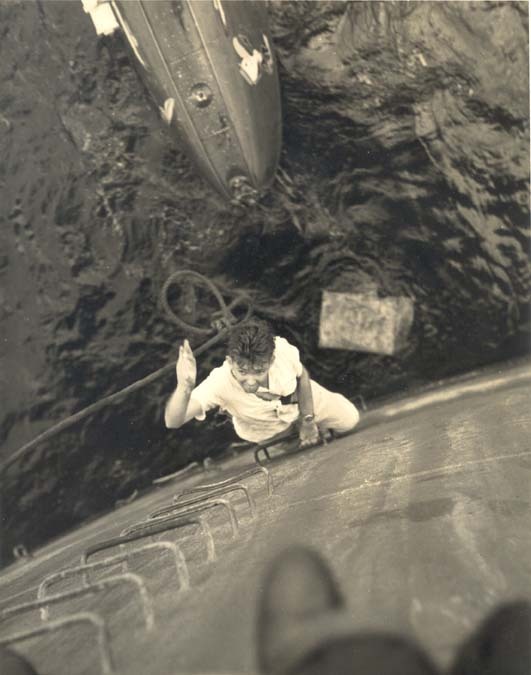 Other photos after their return to the ship are on pages 52 and 53 of the USS Santa Fe Cruise Record. My dad flew another rescue mission on July 4, 1944 at Haha Jima and picked up an aviator named Bill Knox Blair. 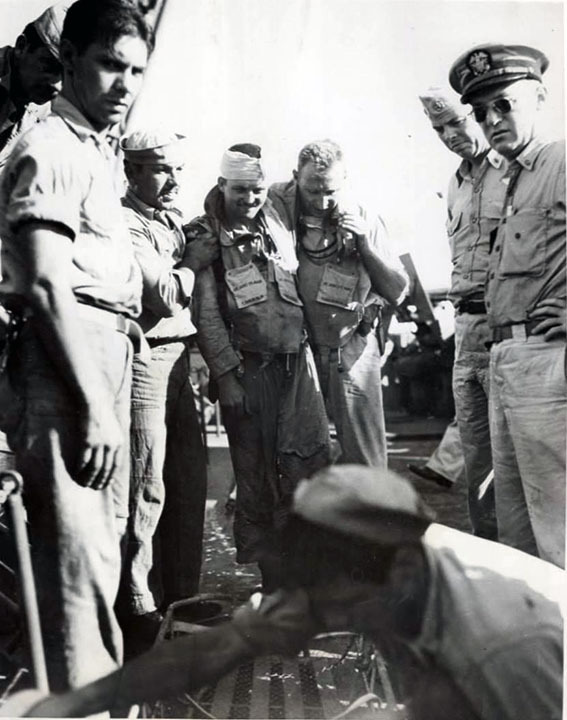 That was the same day that Bob Hendershott and Art Hickman were shot down while spotting for the bombardment of Iwo Jima, but not before Hickman shot down one of the three Zeroes that had attacked them. I believe I have the action report of the Iwo Jima incident if you would be interested in having a copy.